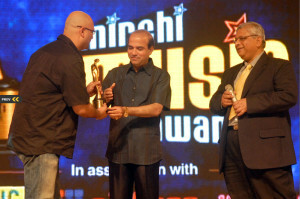 The Mirchi Music awards which were held last evening on the February 10, 2009 awarded the best talent in the music industry. Raju Singh enjoyed the honor of being adjudged the ‘Best music composer and Best background score’ for the film ‘Raaz 2- the mystery continues’. Raju Singh has been an integral part of the music industry from a very young age of 16 years when he would play the Bass guitar for the veteran music director R.D. Burman. Learning from the masters from such a young age has imbibed in Raju a deep understanding about the role of music in films. The background score of ‘Raaz 2’ is the outcome of a close relationship between director, Mohit Suri and Raju Singh that led to a right understanding that translated into the music which won them respect and accolades of the music industry. “The background score is an integral and very important part of the story telling tools in the medium of cinema. It is a primary instrument that amplifies the emotions of the characters and the story. Right from our childhood days, when we were told a story, weren’t the stories we liked best, were the ones that had great sound effects?” says the jubilant composer Raju. “I am truly happy and honored that my colleagues in the industry thought my work worthy of mention and have accorded me this reward,” sign off Raju Singh.